Is your house ready for an earthquake? A house isn’t just a place where you reside, it's your home. Identify possible risks to your house in the next damaging earthquake, and learn about the measures you can take to protect against those risks. Understand the structural risks your house could face during an earthquake. Knowing how earthquakes cause structural damage—why it happens and how you can protect against it—can help you minimize earthquake damage to your house. Browse CEA's structural risk pages to educate yourself on foundation anchors, cripple-wall bracing, and more. No area of California is without earthquake risk, and some terrains increase the risk of house damage from seismic activity. 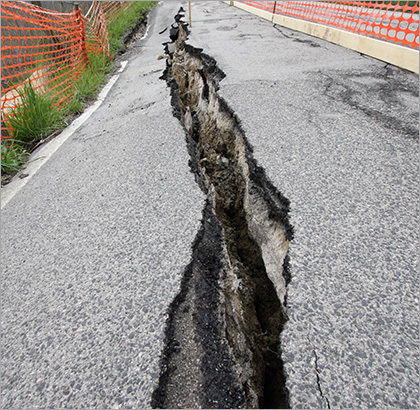 Read our information on geologic hazards, from ground shaking and surface rupture to landslides and liquefaction. Browse these retrofitting FAQs for important details about how you can limit earthquake damage to your house—reasons to retrofit, how retrofits work, and hiring a qualified retrofitting contractor. Q. Why should I retrofit my house? A. California has two-thirds of our nation's earthquake risk. Structures that lack adequate sill plate bolting and cripple-wall bracing are more susceptible to earthquake damage. The frames of older houses are often not bolted to their foundations, and their cripple walls may lack bracing. Houses without adequate bolting and bracing can slide or topple off their foundation during an earthquake, requiring potentially very expensive repairs. But this serious damage can be prevented with a proper seismic retrofit. Q. How can I determine my earthquake risk? A. Interactive hazard maps are available from the California Governor's Office of Emergency Services (CalOES) at its My Hazards Awareness Map website on the “Earthquake Risk” tab. Then enter your address into the map search field at the top of the page. When you click “Map Search,” you will be shown your local earthquake hazard on a map. The page will include a description of risks in your area from other hazards such as flood, fire, or tsunami. Q. Where do I find information about properly bracing my water heater? A. Resources for bracing your water heater include: Earthquake Country Alliance and Seismic CA.